Alix: The old saying “in like a lion, out like a lamb” surely held true for our March! We started out with typically stormy March weather and ended with warm spring temperatures. After months of working wearing bulky mittens and gloves, it has been a pleasure to see how the children’s dexterity has improved. Now that their hands are in thinner gloves and mittens (and sometimes nothing at all), their knot tying (and untying), carabiner clipping (and unclipping) and all small motor tasks have developed leaps and bounds. With spring in the air, and hands freed, many children have spontaneously returned to hand holding while walking to our classroom. This is a testament to the bonds that have been created over the last 7 months, and the growing community of learners that is emerging. The lighter days and warmer temps has instilled a new energy in everybody, as well as in the forest around us – it will be exciting to see what discoveries are made in the next few months! Heather: March seemed to bring us to together as a community, and closer also to our discoveries. Our eyes, noses, and ears have found a plethora of exciting Spring developments! 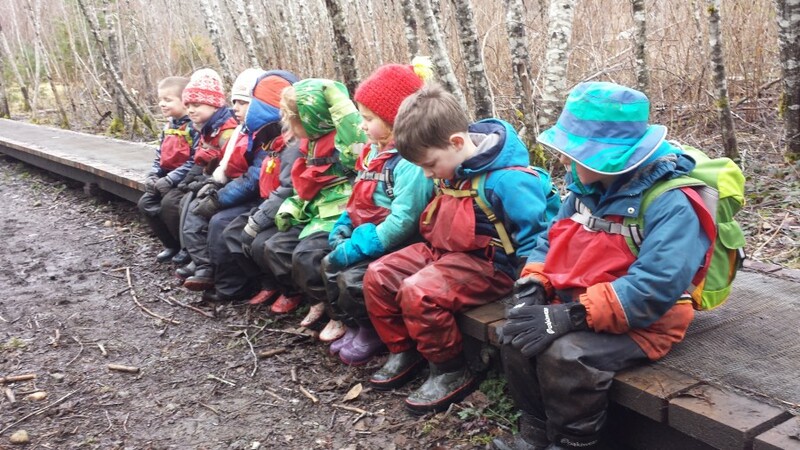 With frogs croaking, bushes budding and flowers unfolding, the group instinctively bonds and connects as a group of learners. In fact, the variety of ways in which the Roots connected with each shows serious social development, growth in languages and ecologoical literacy. I cannot drum up half the times we learned from each other about the species around us, or how the weather, sky, or seasons work. 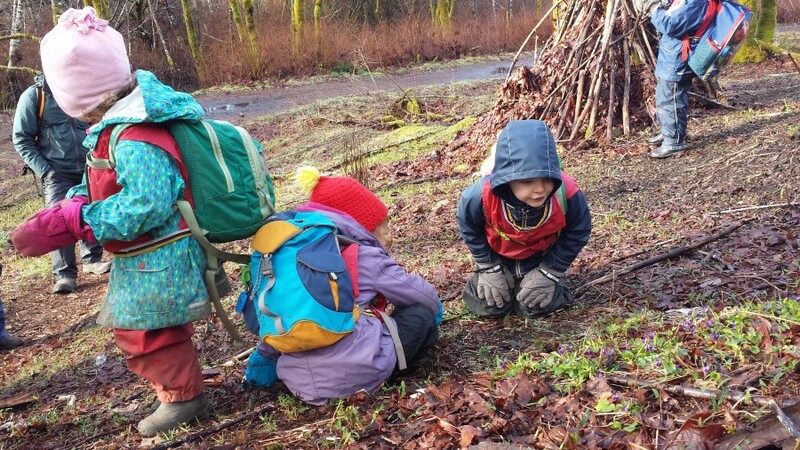 With less trepidation about being wet and cold, and less cumbersome layers to inhibit our hold on nature’s treasures and jungle gyms, I believe the group will find even more depth in our play/learning as we go. In Like a Lion: March started off with some particularly harsh weather. We saw high winds and heavy rains that sparked a lot of interest in water – where it comes from, and where it’s going. We took advantage of its abundance and dabbled with the water cycle a bit. We kicked the month off with Nolans 5th birthday – our group is growing so much! 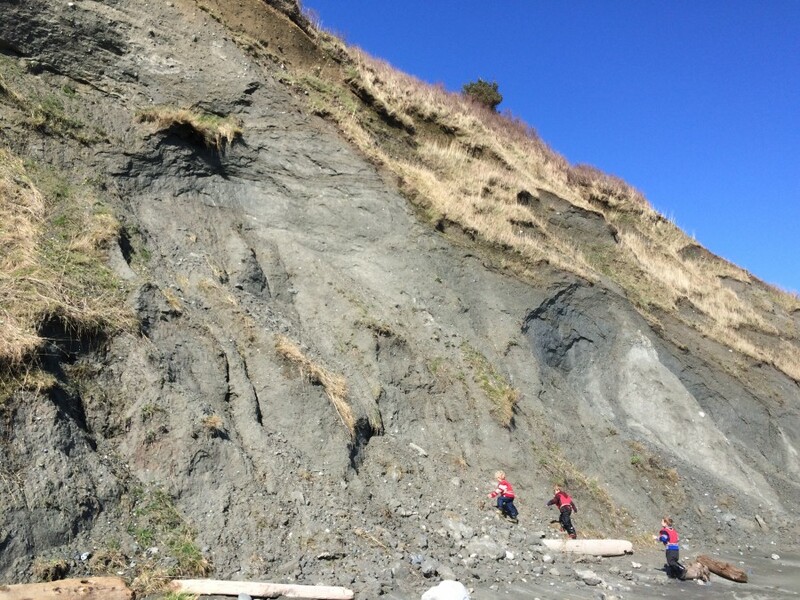 We had our stormiest Root day yet in the first week of March – the wind was so strong that we had to meet at our alternate location. 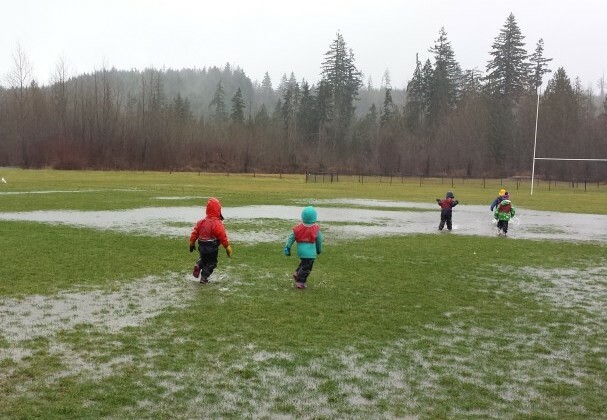 These were possibly the biggest “puddles” that we have played in! 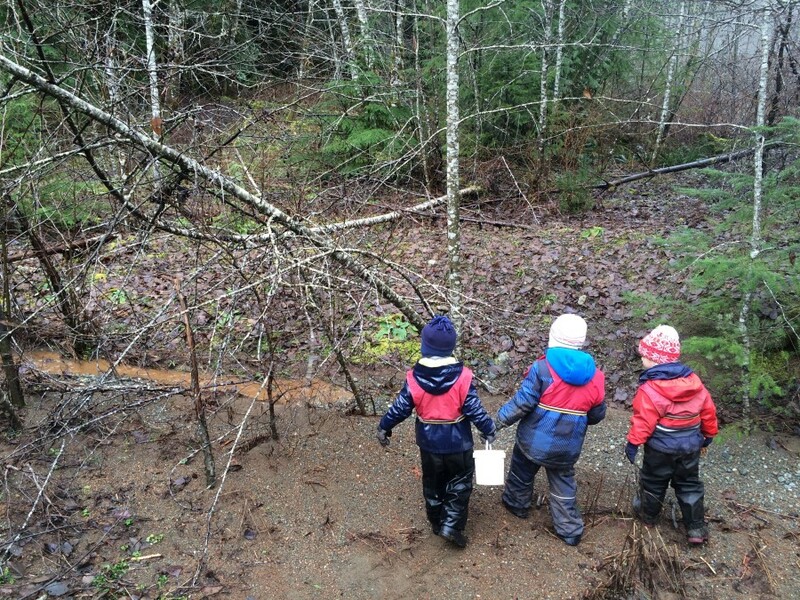 Of course all the rainy weather meant lots of water in our classrooms! 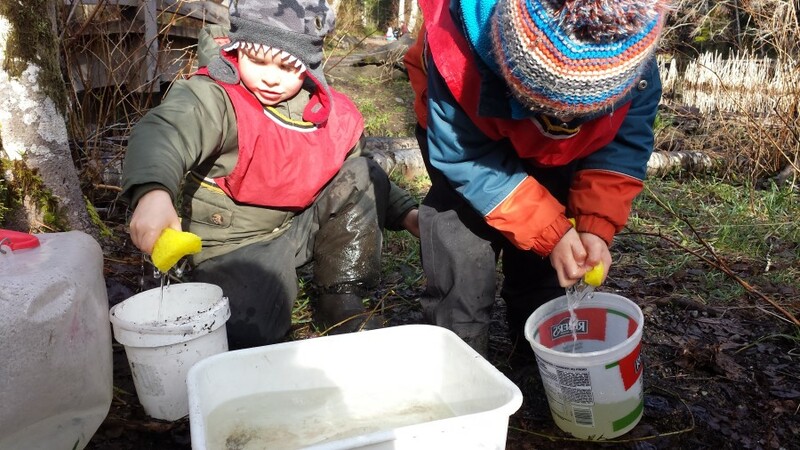 One of the children found this bottle and it became a challenge to see how full they could get it in the creek by experimenting with the angle of the bottle. 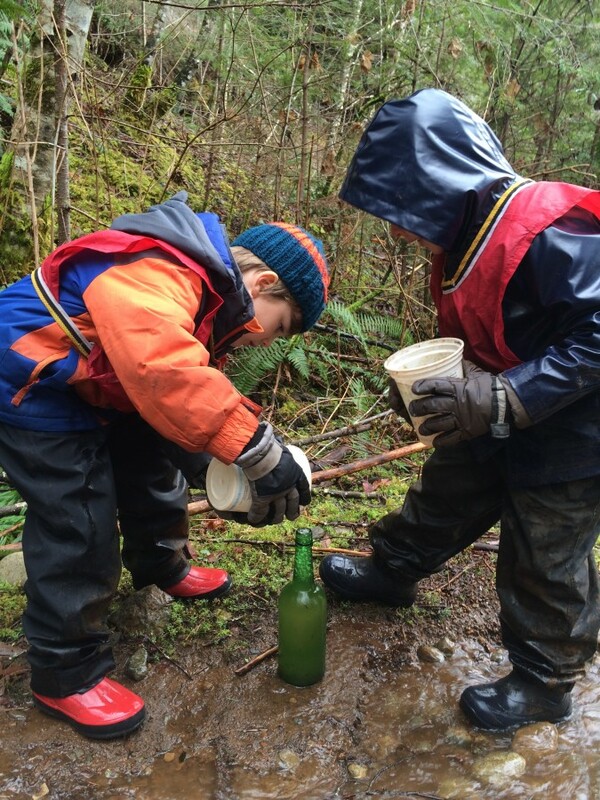 The creek filling method didn’t get the bottle full to the top, so the children tried another tactic – using a second vessel to fill the bottle with. After all that work, it was decided the water should be fed into the river – that’s how we could keep it running. 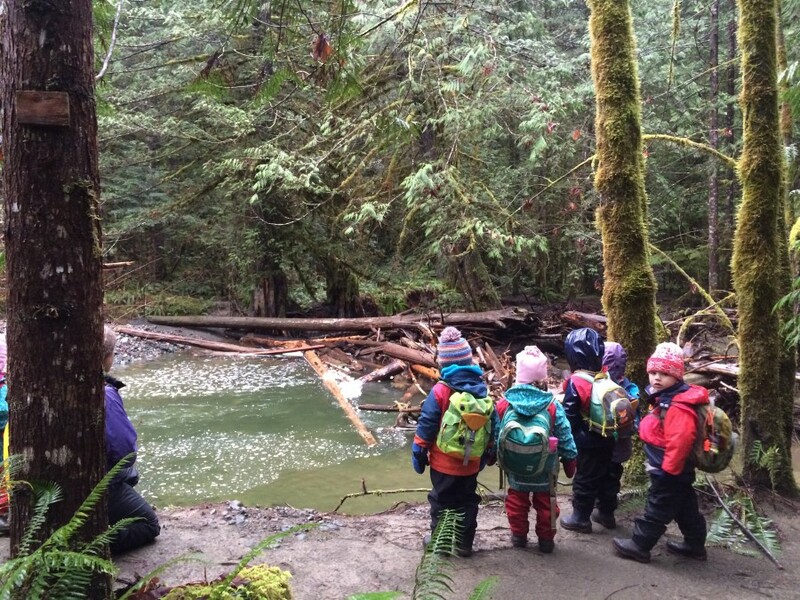 Another day, we had to divert the red climbing tree classroom creek into the river trail classroom. It was a group effort to get the water to run completely through the classroom. Here the children are watching the water run the final length of the bed. Once it had reached the pond below, there was a happy chorus of proud exclamations! It was wonderful to witness! All this water got us interested in where it was coming from, which led to a short study on the water cycle. We read books about it, did some art work around the subject and had this activity for the children to play out the cycle on their own. 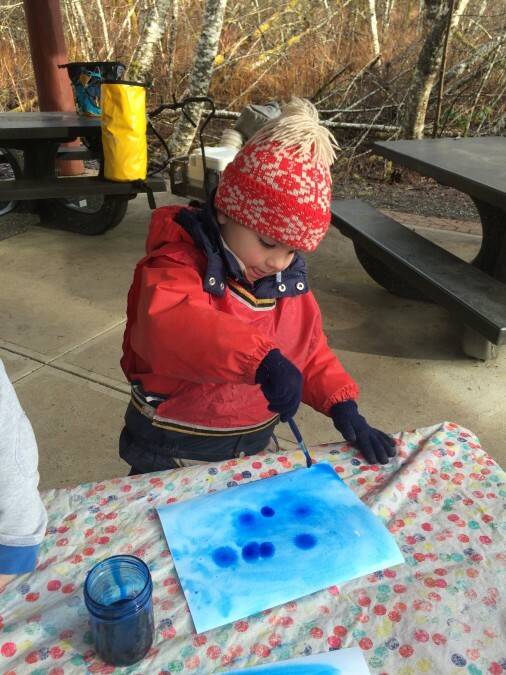 Nolan really “soaked” up the facts and enjoyed explaining to his friends how the sponges were like clouds, pulling water from the lake/basin, and then raining down into the buckets. 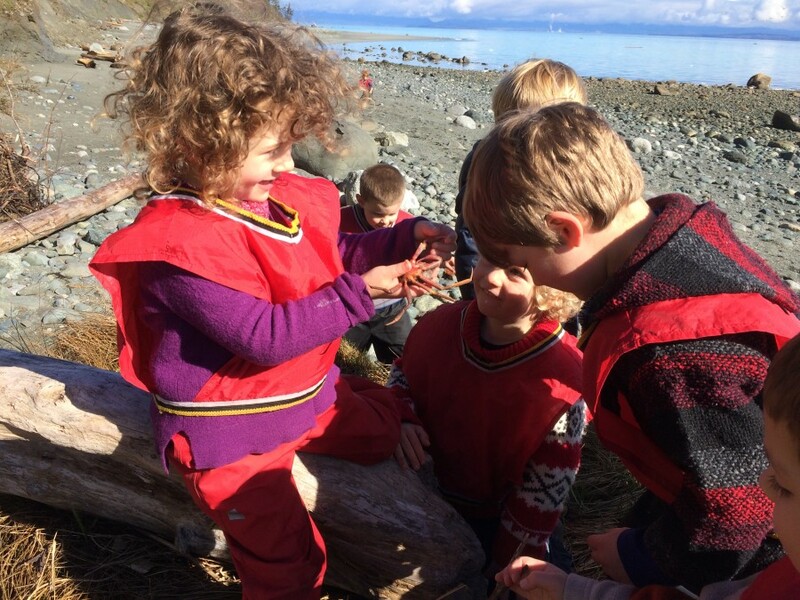 Point Holmes Field Trip: It was a perfect day for a trip to the beach! 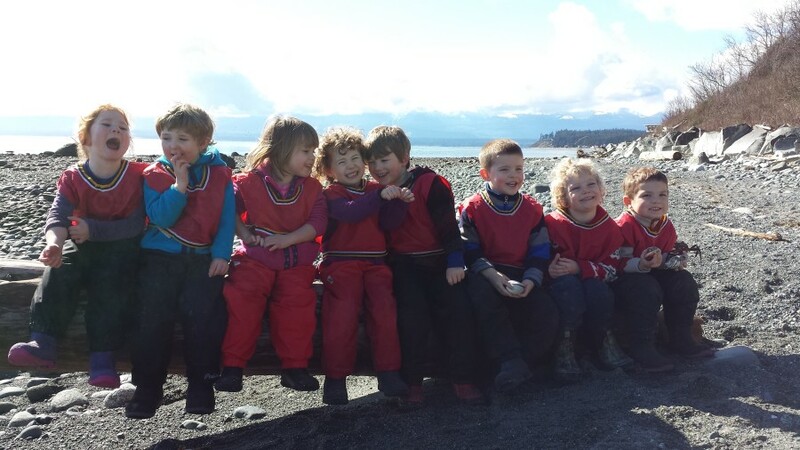 The Roots climbed on the large rocks that prevent erosion, dug in the sand, explored the shore and tide pools and enjoyed a healthy snack in our first gloriously sunny day. 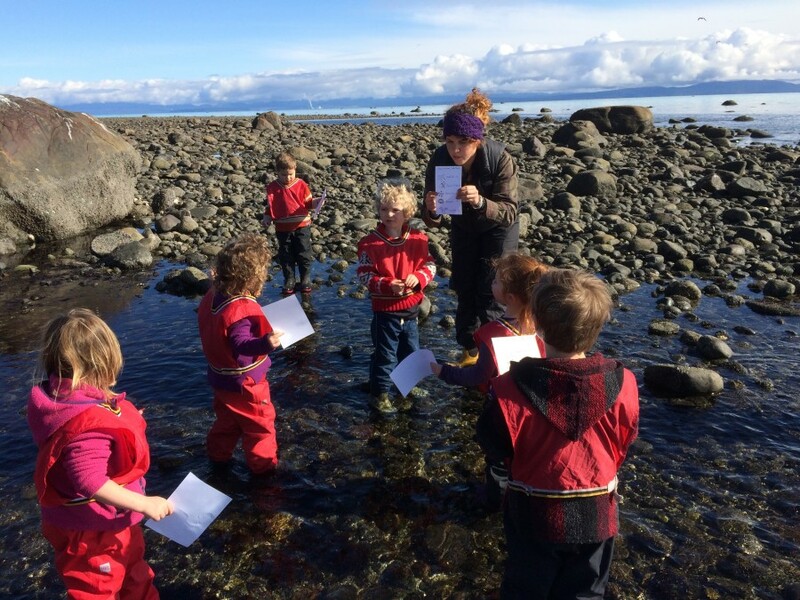 They showed signs of interested and previous knowledge in the tide pool biodiversity when they used a field guide and scavenger hunt to guide their search for a variety of creatures. They got down on all fours for crabs, chitons and more. 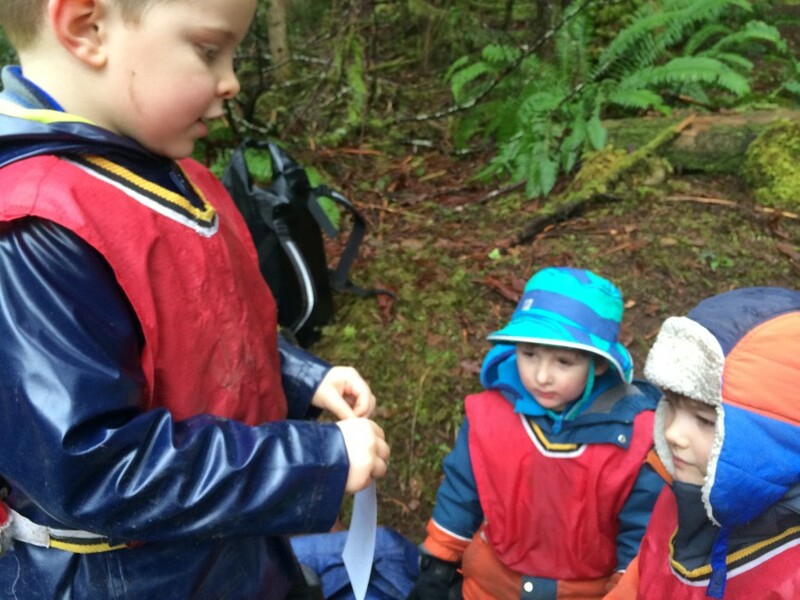 We extend great thanks to all the parents how came and shared their knowledge of the Salish Sea. 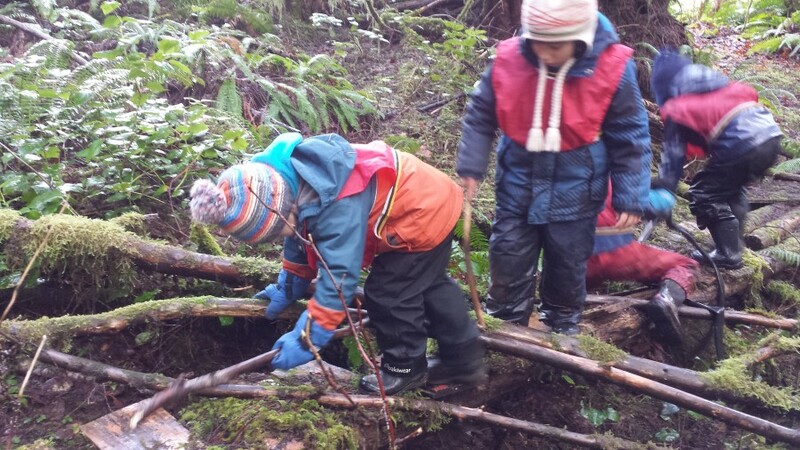 Experimenting with balance: which way is easier to walk along the log – sideways or one foot in front of the other? This crab fueled a lot of learning – first identifying it with a guide, then determining if it is a male or female crab. Jared had his birthday celebration at the beach! 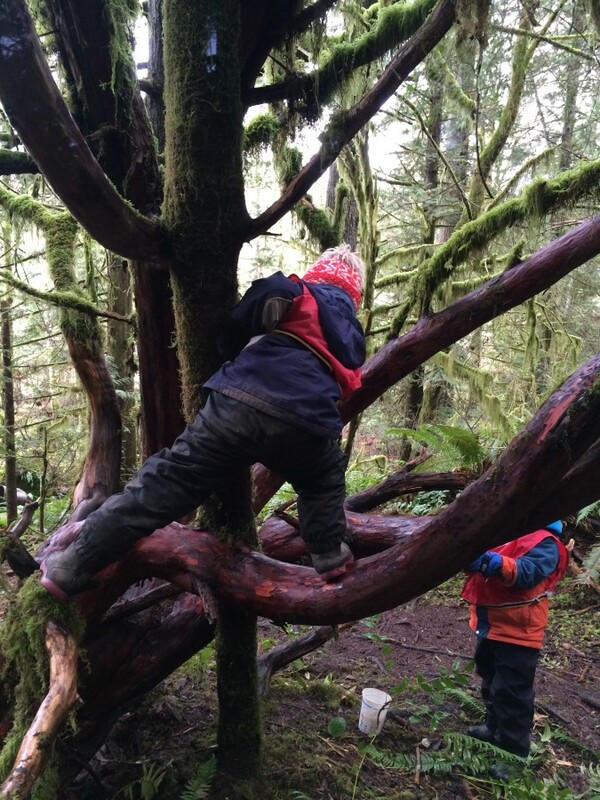 Totally confident and capable children exploring. 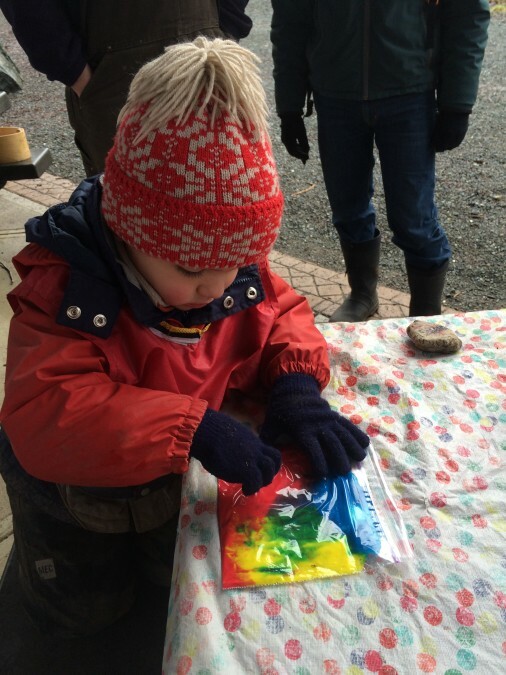 Colours: painting, mixing and finding them! 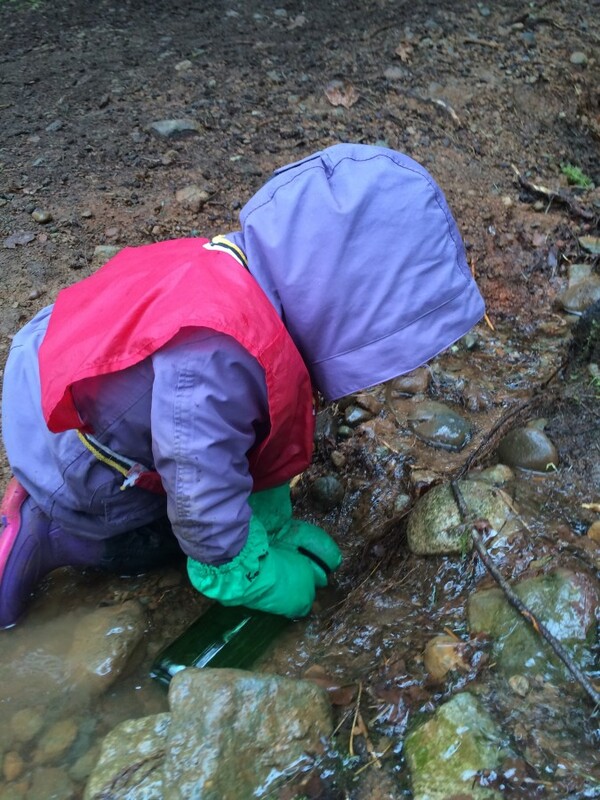 Identifying colours in our changing spring environment was really fun this month. 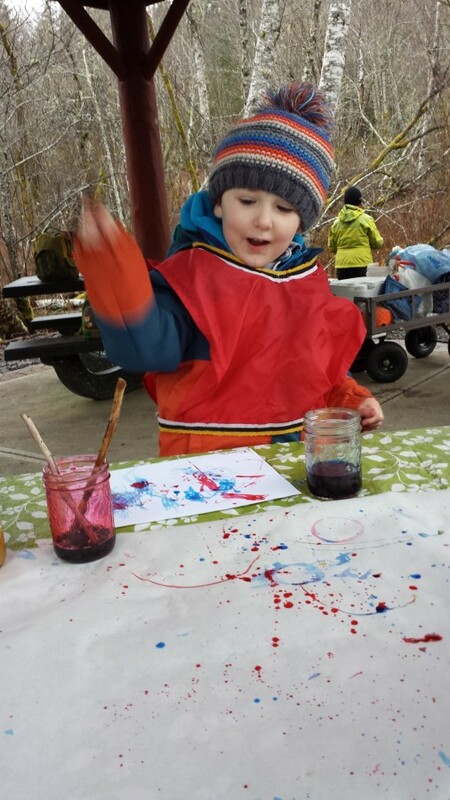 In finding purple, pink, magenta, and white flowers, brilliant greens budding everywhere, we were inspired to paint and play with colour ourselves. 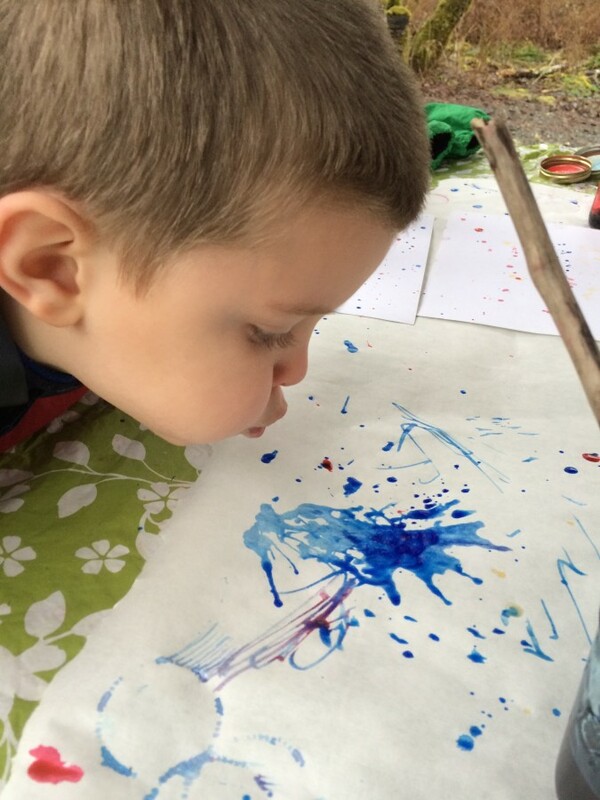 Here are some of the experiments and results from our learning about colours and painting techniques. A mess-free way to experiment with mixing colours. 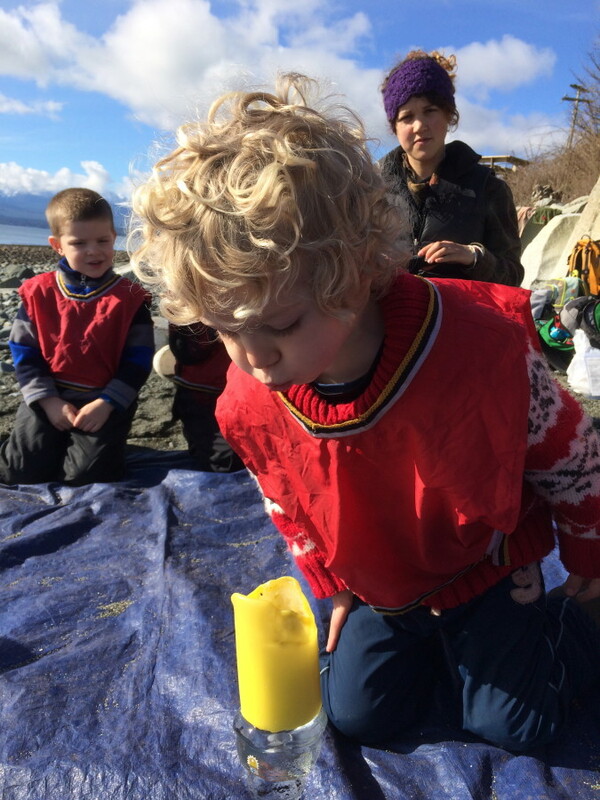 The primary colours were put into a baggie and the children were invited to squish and push and swirl them around with their hands. Some friends even shook their bag. The resulting colours were very unique! Leading up to our beach trip, we played with blue on its own. 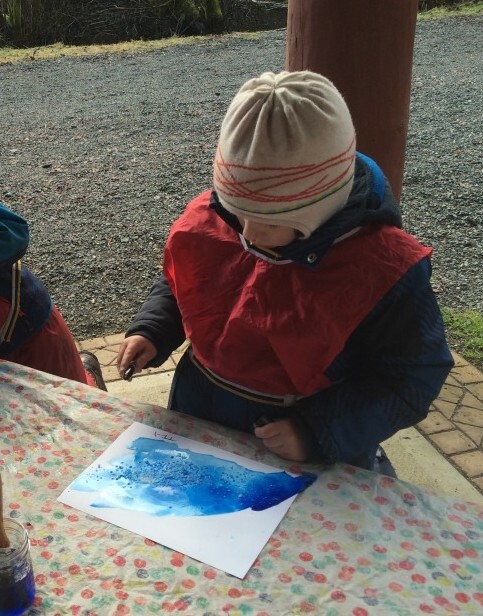 Sprinkling the watercolours with salt created some neat textures. This is science disguised as art! We continued our work with mixing primary colours by doing some drip, or in this case spray, painting. 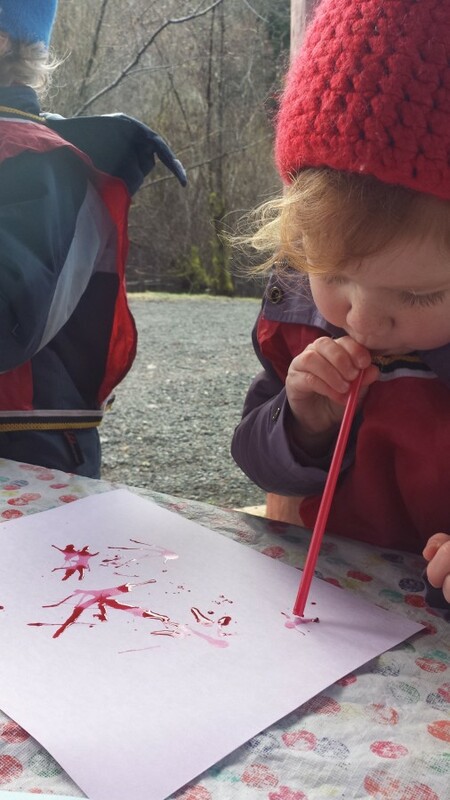 We took the idea and ran – straws were added to the art table and everyone had fun blowing their paint around. Community of Learners Here are some photos that show the strength of the relationship between the Roots – with each other as well as with their environment. They are noticing changes in our forest, and take steps to help keep our forest in good shape. They collaborate and wonder together, and share their knowledge with each other. They invite each other to participate, and listen respectfully to their friends’ ideas. Even though we had a short March (with the last two weeks being our spring break), there were so many examples of this captured by the camera – too many to include all of them. Such as noticing fragrant flowers popping up on the side of the path, and working together to help repair the path around the bridge, just to name two. Noticing new growth in the maple classroom. After the torrential rain storms passed through, some of our beloved trails were washed out. Here Theo has noticed that a small tree’s roots have been exposed to the air. 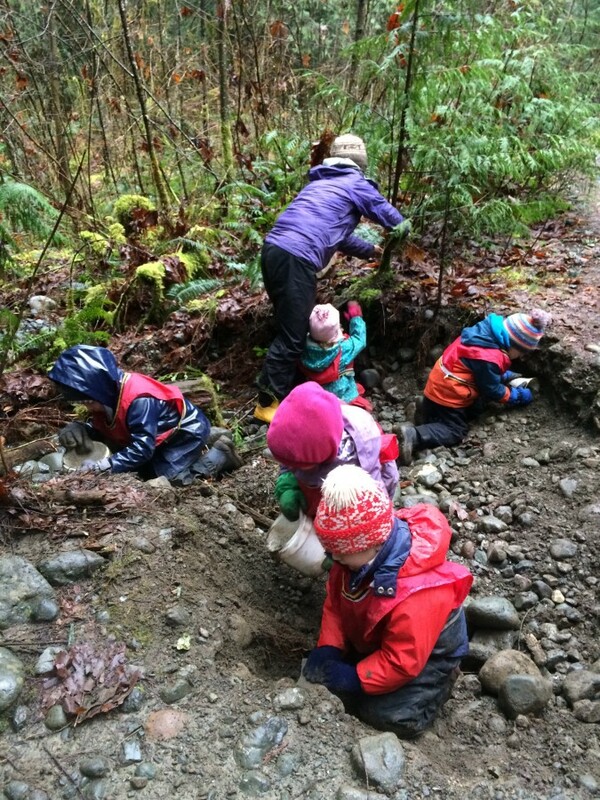 It didn’t take long for the class to rally and work together to bury the roots in the hopes that the baby tree survive. 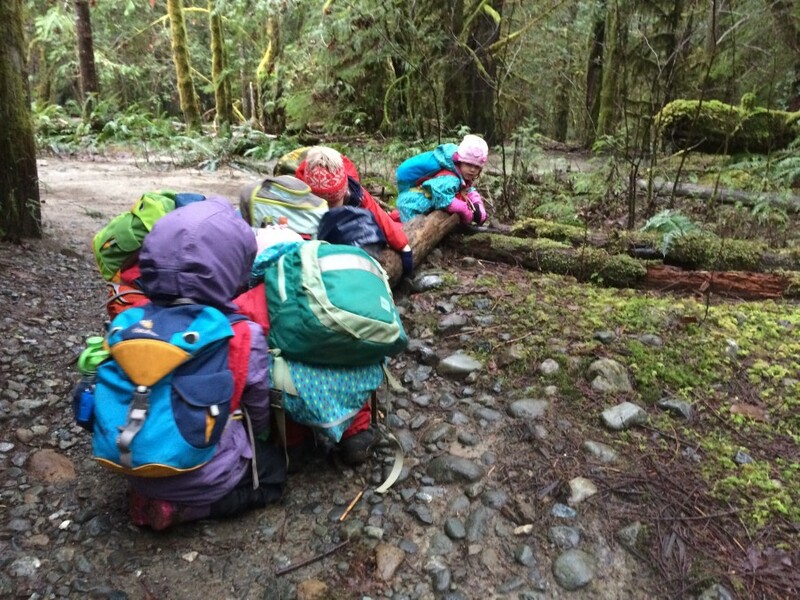 We had never seen the water so high at the log jam, and the class noticed that where there was once just rocks, now the bottom of the river was covered in sand – in fact, the ground all around the log jam was covered in sand. 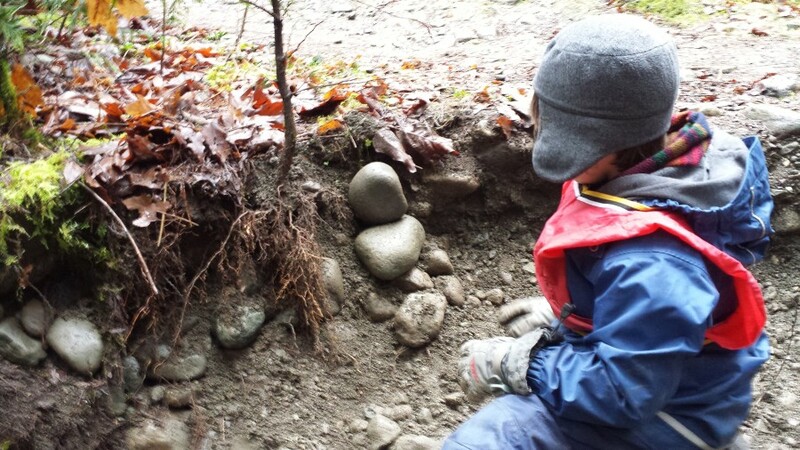 There were a few ideaas about how this happened, and in the end the class agreed that the sand was probably put there by flooding. 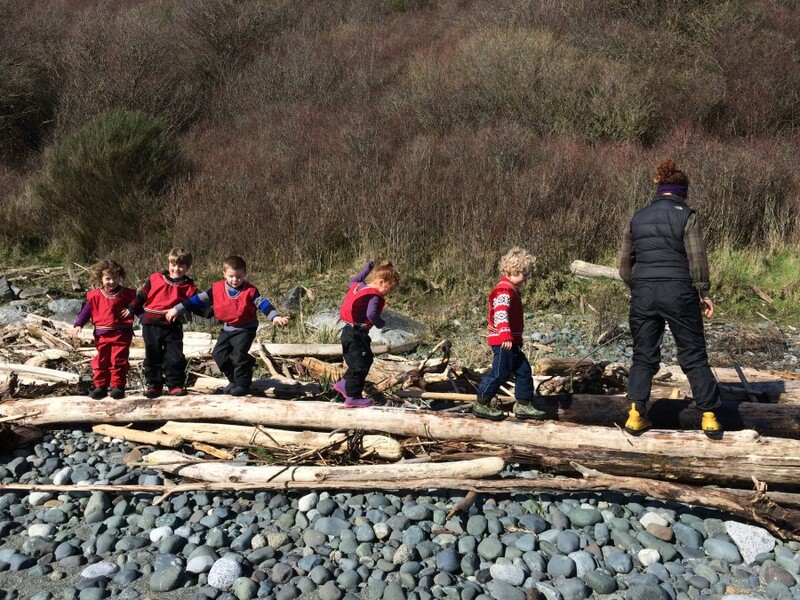 After that consensus was reached, the children found the edges of the sand, to see how high the water had risen. 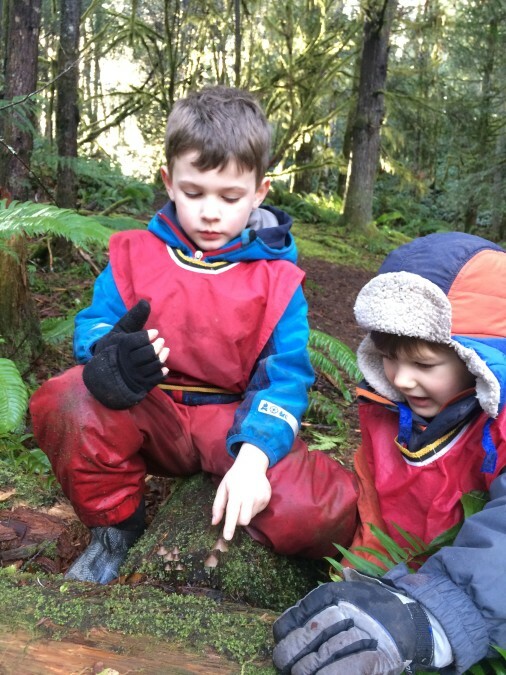 Slugs and mushrooms are returning to our classrooms – things we haven’t seen since the fall. 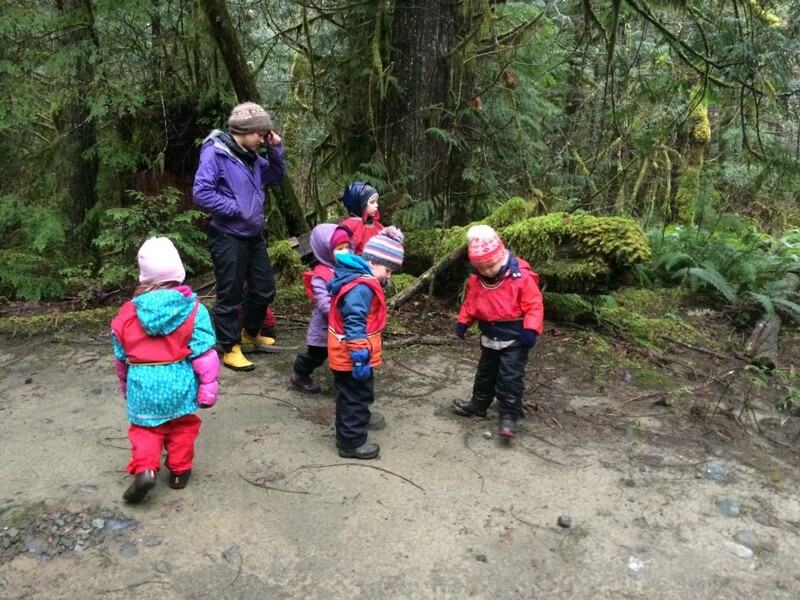 An exercise in listening – we heard birds, frogs, wind and cars. 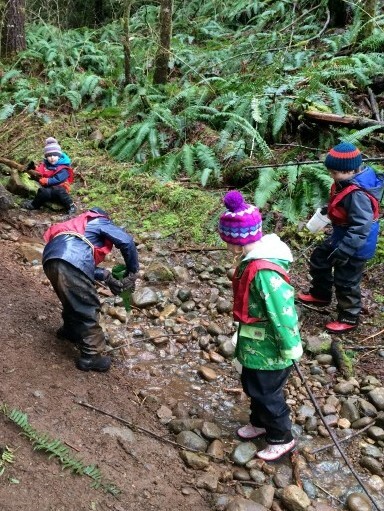 Continual Challenge: With fewer bulky clothes and hand wear, the children are testing their limits and capabilities anew. It’s amazing how much they have developed over the winter! Riskier climbing seemed to be the theme of the month – whether in trees…. … over creeks, up steep hills…. 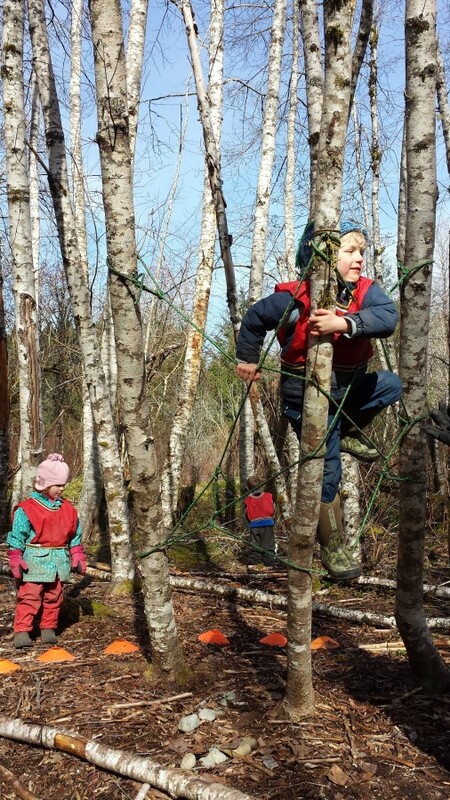 … or on our self-made spider webs, the children enjoyed conquering their fears, pushing their limits and discovering their abilities. 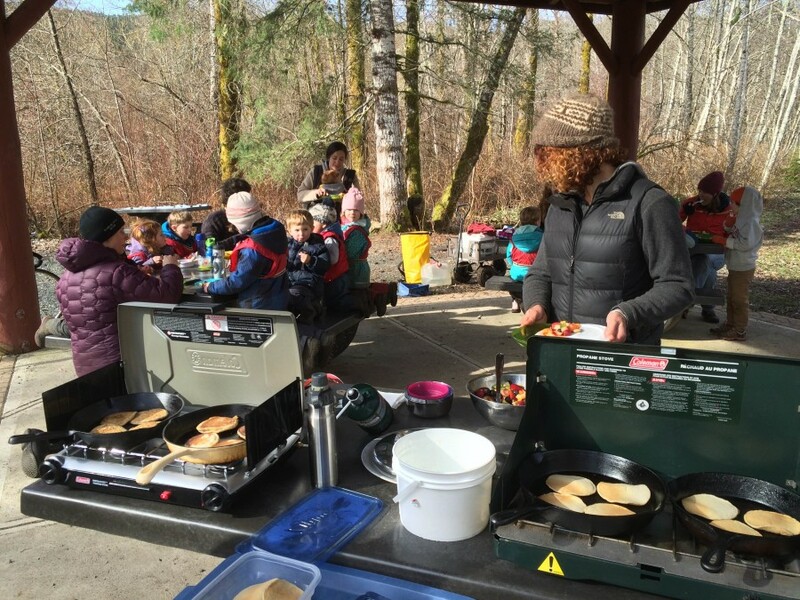 Pancake Breakfast To celebrate Spring, our maple syrup harvest, the beautiful weather and the strength of group and families at having made it through winter, we had a pancake breakfast. We encourage opportunities for safe food sharing at potlucks like this one where allergens are avoided and everyone participates in the making of the food! Everyone contributed fruit to our ‘friendship fruit salad’, and the beautiful rainbow and diversity of fruit well represented our differences and community 🙂 It was fun to have some parents and families join us in our daily routine, and the children really enjoyed having them along to show their school off to. 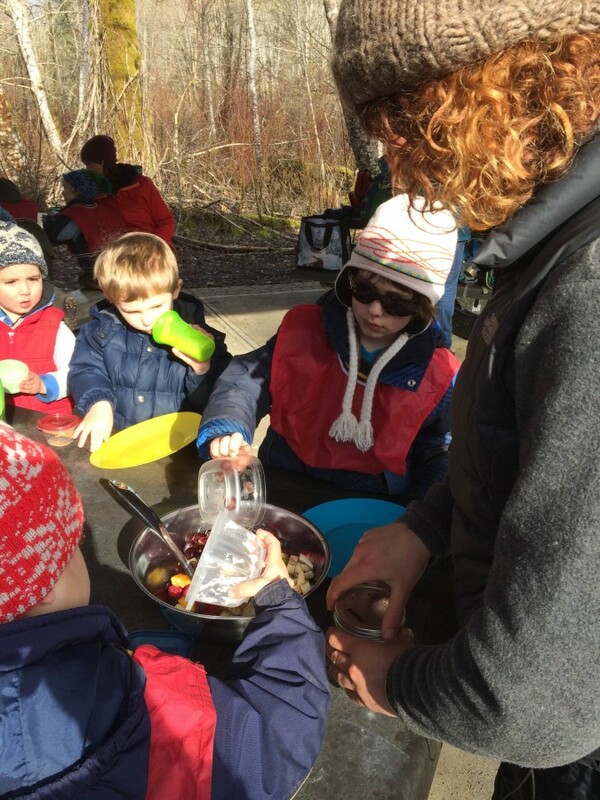 Everyone added some fruit to the salad – it was delicious! What a fantastic way to celebrate spring, and spring break!